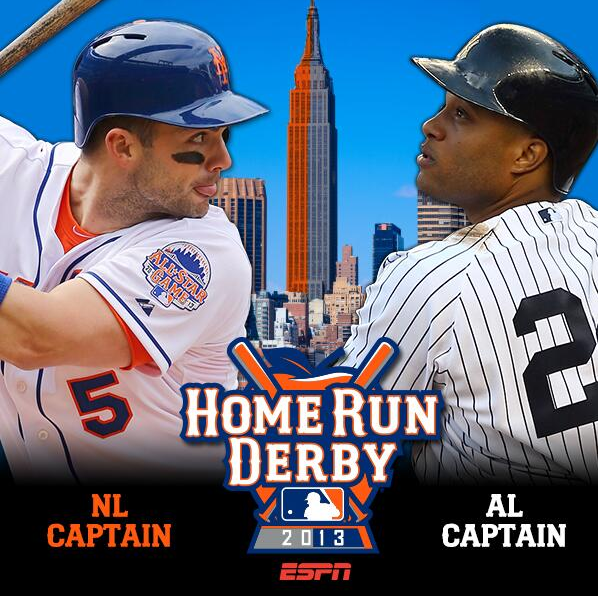 The Home Run Derby might be the most entertaining part of the All-Star festivities. Although the derby can be classified as nothing more than glorified batting practice, there is still something special about the event. You have some of the games best power hitters going at it, hitting balls further than most of us could ever deem possible. One of the coolest parts of the night is seeing all the other All-star’s hanging out and watching in awe of the show these sluggers put on. David Wright – The National League and Mets Captain has 14 home runs on the season. No one knows better than Wright just how hard it can be to get the ball out of Citi Field in the gaps. Wright is not a pure power hitter, like many others in this competition, but may receive an extra bit of adrenaline from the home crowd to help carry him through a round of two. One of the cooler parts of the night is sure to be the ovation he receive when he takes his turn at-bat. Bryce Harper – The Nationals phenom has 13 home runs in just 57 games this year. Although some were displeased with Wright for making this selection, I thought it was a great move. He justified it by stating the fans voted him into the starting line up, meaning they must want to see him hit and he couldn’t be more right. We have been reading folk tales of his childhood home runs ever since Sports Illustrated put him on the cover at 16. I would make him my sleeper pick as he has as much power as anyone, despite his young age. The spotlight doesn’t seem to faze him and I wouldn’t be shocked to see him embrace such as event and put on a show. Michael Cuddyer – Cuddyer, was the most questionable pick for this years derby. Although he has 15 home runs, he is not known to be much of a home run hitter. Wright picked his childhood friend as a favor as much as anything else, which I have no problem with. If you are going to name captains for each league, things like this are bound to happen. Although Wright recalled Cuddyer beating the likes of Ryan Zimmerman and the Upton brother’s and himself in a derby near their hometown, I don’t foresee him putting on much of a show. Pedro Alvarez – Pittsburgh’s third baseman leads this national league squad with 24 home runs. He was named a replacement for the injured Carlos Gonzalez. Alvarez, isn’t exactly a household name himself, but is providing power in the middle of the line up for the first place Pirates. This could be his moment to make the league aware of both the Pirates and himself for years to come. Robsinson Cano – The Yankee second baseman has 21 home runs so far on the year. Cano, will once again have his father along to pitch to him, which is always a cool moment whether you like him or not. I don’t expect Cano to have any problem getting the ball out of Citi Field, as he never seems to struggle with it during the Subway Series. The combination of Cano’s past experience and power make him one of the favorites tonight. Prince Fielder – Detroit’s first baseman is currently sitting with 16 home runs and has become a bit of a forgotten man playing alongside Miguel Cabrera. Fielder, has a swing that is just built for this event. I’m hoping to see him put a ball over the Pepsi Porch tonight. Chris Davis – is leading all of baseball with 37 home runs, tying him with the AL record for home runs at the all-star break. Davis, seems to hit another home run every time I see an Orioles highlight this year. The derby has been known to display break out stars to the whole country and this could very well be Davis’ coming out party. Yoenis Cespedes – The Oakland center fielder was the last selection made by Cano after Jose Bautista turned down the offer. Cespedes, is a guy that many will overlook. He is built like a bull and has a ton of power, but a right-handed hitter might have a hard time getting enough out over the left center field wall. Citi Field is not a hitters ball park, by any means, but I feel lefties will have an easier time getting the ball out, especially up on the Pepsi porch. I don’t think we will see any Josh Hamilton like performances, as the stadium simply won’t allow it. But with he warm weather we are expecting tonight, I do expect these guys will still put on a solid show. With the groove Chris Davis has been on, I think he will walk away the champion this year. This is something I have always wanted to attend myself, which is why I couldn’t resist buying tickets to see an event that is unlikely to return to Queens for another 50 years. Although I won’t be sitting in home run territory, it is sure to be one of those once in a life time events I can say I attended in my home ballpark. Cespedes put on a show for the ages, he’s got more power than he knows what to do with. That was incredible to watch. He was hitting balls up on the third deck with such ease. He really made his presence felt on that national stage last night.